This article is about firearms projectiles. For other uses, see Bullet (disambiguation). A bullet is a kinetic projectile and the component of firearm ammunition that is expelled from the gun barrel during shooting. The term is from Middle French and originated as the diminutive of the word boulle (boullet), which means "small ball". Bullets are made of a variety of materials such as copper, lead, steel, polymer, rubber and even wax. They are available either singly as in muzzleloading and cap and ball firearms or as a component of paper cartridges, but much more commonly in the form of metallic cartridges. Bullets are made in a large number of shapes and constructions depending on the intended applications, including specialized functions such as hunting, target shooting, training and combat. Though the word "bullet" is often used incorrectly in colloquial language to refer to a cartridge round, a bullet is not a cartridge but rather a component of one. A round of ammunition cartridge is a combination package of the bullet (which is the projectile), the case (which holds everything together), the propellant (which provide majority of the energy to launch the projectile) and the primer (which ignites the propellant). This use of the term "bullet" when intending to describe a cartridge often leads to confusion when the components of a cartridge are specifically referred to. Bullet sizes are expressed by their weights and diameters (referred to as "calibers") in both imperial and metric measurement systems. For example: 55 grain .223 caliber bullets are of the same weight and caliber as 3.56 gram 5.56mm caliber bullets. The bullets used in many cartridges are fired at muzzle velocities faster than the speed of sound — about 343 metres per second (1,130 ft/s) in dry air at 20 °C (68 °F) — and thus can travel a substantial distance to a target before a nearby observer hears the sound of the shot. The sound of gunfire (i.e. the muzzle report) is often accompanied with a loud bullwhip-like crack as the supersonic bullet pierces through the air creating a sonic boom. Bullet speeds at various stages of flight depend on intrinsic factors such as its sectional density, aerodynamic profile and ballistic coefficient, and extrinsic factors such as barometric pressure, humidity, air temperature and wind speed. Subsonic cartridges fire bullets slower than the speed of sound so there is no sonic boom. This means that a subsonic cartridge, such as .45 ACP, can be substantially quieter than a supersonic cartridge such as the .223 Remington, even without the use of a suppressor. Bullets do not normally contain explosives, but damage the intended target by transferring kinetic energy upon impact and penetration (see terminal ballistics). The first use of gunpowder in Europe was recorded in 1247. It had been used in China for hundreds of years. The cannon appeared in 1327. Later in 1364, the hand cannon appeared. Early projectiles were made of stone. Stone was used in cannon and hand cannon. In cannon it was eventually found that stone would not penetrate stone fortifications which gave rise to the use of heavier metals for the round projectiles. Hand cannon projectiles developed in a similar fashion following the failure of stone from siege cannon. The first recorded instance of a metal ball from a hand cannon penetrating armor occurred in 1425. In this photograph of shot retrieved from the wreck of the Mary Rose which was sunk in 1545 and raised in 1982. The round shot are clearly of different sizes and some are stone while others are cast iron. The loading of muskets was, therefore, easy with the old smooth-bore Brown Bess and similar military muskets. The original muzzle-loading rifle, however, was loaded with a piece of leather or cloth wrapped around the ball, to allow the ball to engage the grooves in the barrel. Loading was a bit more difficult, particularly when the bore of the barrel was fouled from previous firings. For this reason, and because rifles were not often fitted for a bayonet, early rifles were not generally used for military purposes. The first half of the nineteenth century saw a distinct change in the shape and function of the bullet. In 1826, Henri-Gustave Delvigne, a French infantry officer, invented a breech with abrupt shoulders on which a spherical bullet was rammed down until it caught the rifling grooves. Delvigne's method, however, deformed the bullet and was inaccurate. Square bullets have origins that almost pre-date civilization and were used by slingers in slings. They were typically made out of copper or lead. The most notable use of square bullet designs was done by, James Puckle and Kyle Tunis who patented them, where they were briefly used in one version of the Puckle gun. The early use of these in the black-powder era was soon discontinued due to irregular and unpredictable flight patterns. Delvigne continued to develop bullet design and by 1830 had started to develop cylindro-conical bullets. His bullet designs were improved by Francois Tamisier with the addition of "ball grooves" which are known as "cannelures", these moved the resistance of air behind the center of gravity of the bullet. Tamisier also developed progressive rifling. The rifle grooves were deeper toward the breech, becoming shallower as they progressed toward the muzzle. This causes the bullet to be progressively molded into the grooves which increased range and accuracy. The Thouvenin rifle barrel had a forcing plug in the breech of the barrel to mold the bullet into the rifling with the use of a special ramrod. While successful in increasing accuracy it was extremely hard to clean. These improvements were the basis for the development of the Minié Ball. Among the first pointed or "conical" bullets were those designed by Captain John Norton of the British Army in 1832. Norton's bullet had a hollow base made of lotus pith that, on firing, expanded under pressure to engage with a barrel's rifling. The British Board of Ordnance rejected it because spherical bullets had been in use for the previous 300 years. Renowned English gunsmith William Greener invented the Greener bullet in 1836. Greener fitted the hollow base of an oval bullet with a wooden plug that more reliably forced the base of the bullet to expand and catch the rifling. Tests proved that Greener's bullet was extremely effective, but the military rejected it too because, being two parts, they judged it as too complicated to produce. The soft lead Minié ball was first introduced in 1847 by Claude-Étienne Minié, a captain in the French Army. It was another improvement of the work done by Delvigne. As designed by Minié, the bullet was conical in shape with a hollow cavity in the rear, which was fitted with a small iron cap instead of a wooden plug. When fired, the iron cap would force itself into the hollow cavity at the rear of the bullet, thus expanding the sides of the bullet to grip and engage the rifling. In 1855, the British adopted the Minié ball for their Enfield rifles. In 1855 James Burton, a machinist at the US Armory at Harper's Ferry, West Virginia improved the Minié Ball further by eliminating the metal cup in the bottom of the bullet. The Minié ball first saw widespread use in the American Civil War. Roughly 90% of the battlefield casualties in this war were caused by Minié balls fired from rifled muskets. A similar bullet called the Nessler ball was also developed for smoothbore muskets. Between 1854 and 1857, Sir Joseph Whitworth conducted a long series of rifle experiments, and proved, among other points, the advantages of a smaller bore and, in particular, of an elongated bullet. The Whitworth bullet was made to fit the grooves of the rifle mechanically. The Whitworth rifle was never adopted by the government, although it was used extensively for match purposes and target practice between 1857 and 1866, when it was gradually superseded by Metford's. In 1861 W.B. Chace approached President Abraham Lincoln with an improved ball design for muskets. In firing over the Potomac river where the Chace ball and the round ball were alternated Lincoln observed that the Chace design carried a third or more farther fired at the same elevation. Although Lincoln recommended testing it never took place. About 1862 and later, W. E. Metford carried out an exhaustive series of experiments on bullets and rifling, and invented the important system of light rifling with increasing spiral, and a hardened bullet. The combined result was that in December 1888 the Lee–Metford small-bore (0.303", 7.70 mm) rifle, Mark I, was finally adopted for the British army. The Lee–Metford was the predecessor of the Lee–Enfield. The next important change in the history of the rifle bullet occurred in 1882, when Lt. Colonel Eduard Rubin, director of the Swiss Army Laboratory at Thun, invented the copper-jacketed bullet — an elongated bullet with a lead core in a copper jacket. It was also small bore (7.5mm and 8mm) and it is the precursor of the 8mm Lebel bullet adopted for the smokeless powder ammunition of the Mle 1886 Lebel rifle. The surface of lead bullets fired at high velocity may melt due to hot gases behind and friction with the bore. Because copper has a higher melting point, and greater specific heat capacity and hardness, copper-jacketed bullets allow greater muzzle velocities. European advances in aerodynamics led to the pointed spitzer bullet. By the beginning of the twentieth century, most world armies had begun to transition to spitzer bullets. These bullets flew for greater distances more accurately and carried more energy with them. Spitzer bullets combined with machine guns greatly increased the lethality of the battlefield. The latest advancement in bullet shape was the boat tail, a streamlined base for spitzer bullets. The vacuum created as air moving at high speed passes over the end of a bullet slows the projectile. The streamlined boat tail design reduces this form drag by allowing the air to flow along the surface of the tapering end. The resulting aerodynamic advantage is currently seen as the optimum shape for rifle technology. The first combination spitzer and boat-tail bullet, named Balle "D" from its inventor (a lieutenant-colonel Desaleux), was introduced as standard military ammunition in 1901, for the French Lebel Model 1886 rifle. A ballistic tip bullet is a hollow-point rifle bullet that has a plastic tip on the end of the bullet itself. This improves external ballistics by streamlining the bullet, allowing it to cut through the air more easily, and improves terminal ballistics by allowing the bullet to act as a JHP on impact. As a side effect, it also feeds better in weapons that have trouble feeding rounds that are not FMJ rounds. Bullet designs have to solve two primary problems. In the barrel, they must first form a seal with the gun's bore. If a strong seal is not achieved, gas from the propellant charge leaks past the bullet, thus reducing efficiency and possibly accuracy. The bullet must also engage the rifling without damaging or excessively fouling the gun's bore, and without distorting the bullet, which will also reduce accuracy. Bullets must have a surface that forms this seal without excessive friction. These interactions between bullet and bore are termed internal ballistics. Bullets must be produced to a high standard, as surface imperfections can affect firing accuracy. The physics affecting the bullet once it leaves the barrel is termed external ballistics. The primary factors affecting the aerodynamics of a bullet in flight are the bullet's shape and the rotation imparted by the rifling of the gun barrel. Rotational forces stabilize the bullet gyroscopically as well as aerodynamically. 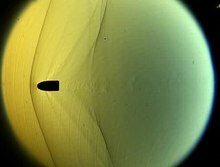 Any asymmetry in the bullet is largely canceled as it spins. However, a spin rate greater than the optimum value adds more trouble than good, by magnifying the smaller asymmetries or sometimes resulting in the bullet exploding midway in flight. With smooth-bore firearms, a spherical shape was optimum because no matter how it was oriented, it presented a uniform front. These unstable bullets tumbled erratically and provided only moderate accuracy; however, the aerodynamic shape changed little for centuries. Generally, bullet shapes are a compromise between aerodynamics, interior ballistic necessities, and terminal ballistics requirements. Another method of stabilization is to place the center of mass of the bullet as far forward as is practical, which is how the Minié ball and the shuttlecock are designed. This makes the bullet fly front-forward by means of aerodynamics. See the articles on terminal ballistics and/or stopping power for an overview of how bullet design affects what happens when a bullet impacts with an object. The outcome of the impact is determined by the composition and density of the target material, the angle of incidence, and the velocity and physical characteristics of the bullet itself. Bullets are generally designed to penetrate, deform, or break apart. For a given material and bullet, the strike velocity is the primary factor that determines which outcome is achieved. Bullet shapes are many and varied, and an array of them can be found in any reloading manual that sells bullet moulds. Mould manufacturers such as RCBS, Paul Jones Moulds, and David Mos offer many different calibers and designs. With a mould, bullets can be made at home for reloading one's own ammunition, where local laws allow. Hand-casting, however, is only time- and cost-effective for solid lead bullets. Cast and jacketed bullets are also commercially available from numerous manufacturers for hand loading and are much more convenient than casting bullets from bulk lead. Bullets for black powder, or muzzle-loading firearms, were classically molded from pure lead. This worked well for low-speed bullets, fired at velocities of less than 450 m/s (1475 ft/s). For slightly higher-speed bullets fired in modern firearms, a harder alloy of lead and tin or typesetter's lead (used to mold Linotype) works very well. For even higher-speed bullet use, jacketed coated lead bullets are used. The common element in all of these, lead, is widely used because it is very dense, thereby providing a high amount of mass—and thus, kinetic energy—for a given volume. Lead is also cheap, easy to obtain, easy to work, and melts at a low temperature, which results in comparatively easy fabrication of bullets. Lead: Simple cast, extruded, swaged, or otherwise fabricated lead slugs are the simplest form of bullets. At speeds of greater than 300 m/s (1000 ft/s) (common in most handguns), lead is deposited in rifled bores at an ever-increasing rate. Alloying the lead with a small percentage of tin and/or antimony serves to reduce this effect, but grows less effective as velocities are increased. A cup made of harder metal, such as copper, placed at the base of the bullet and called a gas check, is often used to decrease lead deposits by protecting the rear of the bullet against melting when fired at higher pressures, but this too does not solve the problem at higher velocities. Jacketed lead: Bullets intended for even higher-velocity applications generally have a lead core that is jacketed or plated with gilding metal, cupronickel, copper alloys, or steel; a thin layer of harder metal protects the softer lead core when the bullet is passing through the barrel and during flight, which allows delivering the bullet intact to the target. There, the heavy lead core delivers its kinetic energy to the target. Full metal jacket or "ball" bullets (cartridges with ball bullets (which despite the name are not spherical) are called ball ammunition) are completely encased in the harder metal jacket, except for the base. Some bullet jackets do not extend to the front of the bullet, to aid expansion and increase lethality; these are called soft point (if the exposed lead tip is solid) or hollow point bullets (if a cavity or hole is present). Steel bullets are often plated with copper or other metals for corrosion resistance during long periods of storage. Synthetic jacket materials such as nylon and Teflon have been used, with limited success, especially in rifles; however, hollow point bullets with plastic aerodynamic tips have been very successful at both improving accuracy and enhancing expansion. Newer plastic coatings for handgun bullets, such as Teflon-coated bullets, are making their way into the market. Hard cast solid bullet (left), with gas check (center) and lubrication (right). 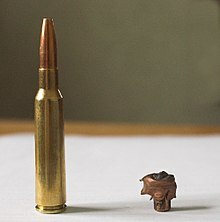 Solid or Monolithic Solid: mono-metal bullets intended for deep penetration in big game animals and slender shaped very-low-drag projectiles for long range shooting are produced out of metals like oxygen free copper and alloys like copper nickel, tellurium copper and brass, for example highly machinable UNS C36000 Free-Cutting Brass. Often these projectiles are turned on precision CNC lathes. In the case of solids, and the ruggedness of the game animals on which they are used, e.g., the African buffalo or elephant, expansion is almost entirely relinquished for the necessary penetration. In shotgunning, "slug" loads are often solid large single lead projectiles, sometimes with a hollow point, used for deer or wild pig hunting in jurisdictions that do not allow rifles (because a missed slug shot will travel considerably less far than a rifle bullet). Fluted: In appearance, these are solid bullets with scalloped sides (missing material). The theory is that the flutes produce hydraulic jetting when passing through tissues, creating a wound channel larger than that made by conventional expanding ammunition such as hollowpoints. Hard Cast: A hard lead alloy intended to reduce fouling of rifling grooves (especially of the polygonal rifling used in some popular pistols). Benefits include simpler manufacture than jacketed bullets and good performance against hard targets; limitations are an inability to mushroom and subsequent over-penetration of soft targets. Blanks: Wax, paper, plastic, and other materials are used to simulate live gunfire and are intended only to hold the powder in a blank cartridge and to produce noise, flame and smoke. The "bullet" may be captured in a purpose-designed device or it may be allowed to expend what little energy it has in the air. Some blank cartridges are crimped or closed at the end and do not contain any bullet; some are fully loaded cartridges (without bullets) designed to propel rifle grenades. Note that blank cartridges, at short ranges, can be lethal due to the force of the expanding gas – numerous tragic accidents have occurred with blank cartridges (e.g., the death of actor Jon-Erik Hexum). Practice: Made from lightweight materials like rubber, wax, wood, plastic, or lightweight metal, practice bullets are intended for short-range target work, only. Because of their weight and low velocity, they have limited range. Polymer: These are metal-polymer composites, generally lighter and higher velocity than a pure metal bullet of the same dimensions. They permit unusual designs that are difficult with conventional casting or lathing. Less lethal, or Less than Lethal: Rubber bullets, plastic bullets, and beanbags are designed to be non-lethal, for example for use in riot control. They are generally low velocity and are fired from shotguns, grenade launchers, paint ball guns, or specially designed firearms and air gun devices. Incendiary: These bullets are made with an explosive or flammable mixture in the tip that is designed to ignite on contact with a target. The intent is to ignite fuel or munitions in the target area, thereby adding to the destructive power of the bullet itself. Exploding: Similar to the incendiary bullet, this type of projectile is designed to explode upon hitting a hard surface, preferably the bone of the intended target. Not to be mistaken for cannon shells or grenades with fuse devices, these bullets have only a cavity filled with a small amount of low explosive depending on the velocity and deformation upon impact to detonate. Exploding bullets have been used on various aircraft machine guns and on anti materiel rifles. Tracer: These have a hollow back, filled with a flare material. Usually this is a mixture of magnesium metal, a perchlorate, and strontium salts to yield a bright red color, although other materials providing other colors have also sometimes been used. Tracer material burns out after a certain amount of time. Such ammunition is useful to the shooter as a means of learning how to point shoot moving targets with rifles. This type of round is also used by all branches of the United States military in combat environments as a signaling device to friendly forces. Normally it is loaded at a four to one ratio with ball ammunition and is intended to show where the shooter are firing so friendly forces can engage the target as well. The flight characteristics of tracer rounds differ from normal bullets due to their lighter weight. Armor-piercing: Jacketed designs where the core material is a very hard, high-density metal such as tungsten, tungsten carbide, depleted uranium, or steel. A pointed tip is often used, but a flat tip on the penetrator portion is generally more effective. Nontoxic shot: Steel, bismuth, tungsten, and other exotic bullet alloys prevent release of toxic lead into the environment. Regulations in several countries mandate the use of nontoxic projectiles especially when hunting waterfowl. It has been found that birds swallow small lead shot for their gizzards to grind food (as they would swallow pebbles of similar size), and the effects of lead poisoning by constant grinding of lead pellets against food means lead poisoning effects are magnified. Such concerns apply primarily to shotguns, firing pellets (shot) and not bullets, but there is evidence suggesting that consumption of spent rifle and pistol ammunition is also hazardous to wildlife. Reduction of hazardous substances (RoHS) legislation has also been applied to bullets on occasion to reduce the impact of lead on the environment at shooting ranges. United States Environmental Protection Agency announced that the agency does not have the legal authority to regulate this type of product (lead bullets) under the Toxic Substances Control Act (TSCA), nor is the agency seeking such authority. With some nontoxic shot, e.g., steel shot, care must be taken to shoot only in shotguns (and with chokes) specifically designed and designated for steel shot; for other, particularly older, shotguns, serious damage to the barrel and chokes can occur. And, because steel is lighter and less dense than lead, larger sized pellets must be used, thus reducing the number of pellets in a given charge of shot and possibly limiting patterns on the target; other formulations, e.g. bismuth, do not present this disability. Blended-metal: Bullets made using cores from powdered metals other than lead with binder or sometimes sintered. Frangible: Designed to disintegrate into tiny particles upon impact to minimize their penetration for reasons of range safety, to limit environmental impact, or to limit the shoot-through danger behind the intended target. An example is the Glaser Safety Slug, usually a pistol caliber bullet made from an amalgam of lead shot and a hard (and thus frangible) plastic binder designed to penetrate a human target and release its component shot pellets without exiting the target. Multiple impact bullet: Bullets that are made of separate slugs that fit together inside the cartridge, and act as a single projectile inside the barrel as they are fired. The projectiles part in flight, but are held in formation by tethers that keep the individual parts of the "bullet" from flying too far away from each other. The intention of such ammo is to increase hit chance by giving a shot-like spread to rifled slug firing guns, while maintaining a consistency in shot groupings. Multiple impact bullets may be less stable in flight than conventional solid bullets because of the added aerodynamic drag from the tether line holding the pieces in formation, and each projectile affects the flight of all the others. This may limit the benefit provided by the spread of each bullet at longer ranges. Poisonous bullets were a subject to an international agreement as early as the Strasbourg Agreement (1675). The St. Petersburg Declaration of 1868 prohibited the use of explosive projectiles weighing less than 400 grams.The reasoning was that they figured if bullets were more deadly there would be less suffering. The Hague Convention prohibits certain kinds of ammunition for use by uniformed military personnel against the uniformed military personnel of opposing forces. These include projectiles that explode within an individual, poisoned and expanding bullets. Protocol III of the 1983 Convention on Certain Conventional Weapons, an annexe to the Geneva Conventions, prohibits the use of incendiary ammunitions against civilians. These treaties apply even to .22 LR bullets used in pistols, rifles and machine guns. Hence, the High Standard HDM pistol, a .22 LR suppressed pistol, had special bullets developed for it during World War II that were full metal jacketed, in place of the soft-point and hollow-point bullets that are otherwise ubiquitous for .22 LR rounds. Some jurisdictions acting on environmental concerns have banned hunting with lead bullets and shotgun pellets. In December 2014, a federal appeals court denied a lawsuit by environmental groups that the EPA must use the Toxic Substances Control Act to regulate lead in shells and cartridges. The groups sought to regulate "spent lead", yet EPA could not regulate spent lead without also regulating cartridges and shells, per the court. UNI-Classic – RWS deformation bullet, ex-TUG after Brenneke-license was not renewed. ^ Merriam-Webster Dictionary (5th ed.). Springfield, Massachusetts: Merriam-Webster Incorporated. 1994. ISBN 0-87779-911-3. ^ "Hornady Lead Round Ball Black Powder Bullets". www.sportsmanswarehouse.com. Retrieved 28 January 2017. ^ "Paper Cartridge Kit, .58cal rounds, 20 Count (with Minie Balls)". regtqm.com. Retrieved 28 January 2017. ^ "The Self Contained Cartridge". nrablog.com. The National Rifle Association. Retrieved 28 January 2017. ^ "Bullet Types: A Reference Guide". cheaperthandirt.com. Retrieved 28 January 2017. ^ "What is Caliber? Bullet Sizes Explained". thefirearms.guide. Retrieved 28 January 2017. ^ "Handgun Ballistics" (PDF). hornady.com. Retrieved 28 January 2017. ^ "Ballistics – Rifle Ammunition Product Lines" (PDF). hornady.com. Retrieved 28 January 2017. ^ INSPIREME (2 January 2016). "HOW fast bullet travels" – via YouTube. ^ "Mythbusters Museum". Mythbusters Museum. ^ "Can You Suppress Supersonic Ammo?". silencershop.com. silencershop.com. Retrieved 1 February 2017. ^ Swift, B; Rutty, GN. "The exploding bullet". J Clin Pathol. 57: 108. doi:10.1136/jcp.57.1.108. PMC 1770159. PMID 14693853. ^ "Important Dates in Gun History". armscollectors.com. Retrieved 29 January 2017. ^ "A Cannon from the Mary Rose". teachinghistory100.com. The British Museum. ^ "Precision Shooting Patches for round ball – Track of the Wolf". www.trackofthewolf.com. ^ "How to load a musket". tamu.edu. The Second Flying Company of Alamo de Parras. Retrieved 29 January 2017. ^ Gibbon, John. The Artillerist's Manual. p. 125. ^ Pollock, Arthur William Alsager (16 May 2017). "The United Service Magazine". H. Colburn – via Google Books. ^ "Rifling: Expanding Bullets and the Minié Rifle". firearmshistory.blogspot.com. Firearms History, Technology & Development. Retrieved 29 January 2017. ^ Howey, Allan W. "Facts, information and articles about the Minié Ball, a Civil War bullet". historynet.com. Civil War Times Magazine. Retrieved 29 January 2017. ^ "Rifling: Expanding Bullets and the Minié Rifle". firearmshistory.blogspot.com. Retrieved 29 January 2017. ^ "National Park Service Museum Collections". Retrieved 29 January 2017. ^ "Top 10 Rare and Endangered Artifacts". nps.gov. nps.gov. Retrieved 29 January 2017. ^ "Minié Ball". history.com. history.com. Retrieved 29 January 2017. ^ "Nessler Ball & Ribbed Slug". castboolits.gunloads.com. Retrieved 29 January 2017. ^ Bilby, Joe (1999). "Pedersoli musket, Nessler Balls and RCBS Dies". civilwarguns.com. Retrieved 29 January 2017. ^ "Lee Metford (Magazine Lee Metford / MLM) Bolt-Action Service Rifle (1888)". militaryfactory.com. Retrieved 29 January 2017. ^ "RCBS". RCBS. Archived from the original on 2012-03-26. Retrieved 2012-08-10. ^ Hughes, David (1990). The History and Development of the M16 Rifle and Its Cartridge. Oceanside: Armory Pub. ISBN 978-0-9626096-0-2. ^ "Research—Eagles and Lead". SOAR Raptor Foundation. ^ Glover, William H. "Purposes and Basic Principles of the Law of War". Retrieved 2010-07-28. ^ "9 Weapons That are Banned From Modern War". Retrieved 2017-11-02. ^ Zack Colman (December 23, 2014). "EPA can't regulate lead bullets, says federal court". Washington Examiner. Retrieved 30 December 2014. ^ "Bullet Basics 1- Materials; Remington Accelerator (at bottom of page)". Firearmsid.com. Retrieved 2012-08-10. ^ Bullets, Frontier. "Frontier Bullets". Frontier Bullets. ^ "FAQ – Berry's Manufacturing". www.berrysmfg.com. ^ "RWS | Rottweil: RWS | Rottweil". Jagd.rottweil-munition.de. Archived from the original on August 18, 2011. Retrieved 2012-08-08. ^ BGB Enterprises. "Lead Bullets Technology – Premium Molds". Lbtmoulds.com. Retrieved 2012-08-10. ^ "TAG". Brenneke-munition.de. 2008-01-24. Retrieved 2012-08-08. ^ "TIG". Brenneke-munition.de. 2008-01-24. Retrieved 2012-08-08. ^ "TUG". Brenneke-munition.de. Retrieved 2012-08-08. ^ "TOG". Brenneke-munition.de. 2008-01-24. Retrieved 2012-08-08. Look up bullet in Wiktionary, the free dictionary. Wikimedia Commons has media related to Bullets.